Directions: From Meyers, at Junction of Highways 50-89, take Highway 89 South and go 11 miles to junction with Highway 88. Turn West and go 2.5 miles on Highway 88 to Blue Lakes Road. Turn South and go 12 miles to Lower Blue Lake. Road turns North, 2 miles more to Upper Blue Lake. 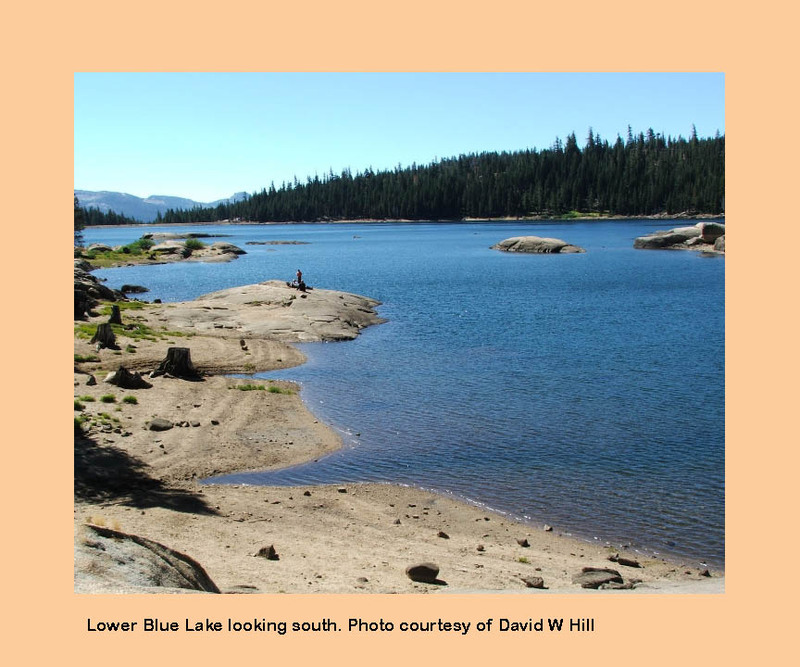 Notes: Upper and Lower Blue Lake are two reservoirs made by PG&E by damming Blue Creek within the Sierra high country at 8,200 feet. Both lakes are well stocked with about 20,000 Rainbows annually. Upper Blue Lake also gets 20,000 Lahonton Cutthroat fingerlings each year. Brookies are present in each lake as well. Each are deep lakes with boat ramps and a sizeable crowd trolling for trout. Float tubing opportunities are best with Upper Blue Lake that provides some shallower shorelines. On Lower Blue Lake, try fishing the rock wall in the evenings with a Parachute Adams or Elk Hair Caddis #14-16. 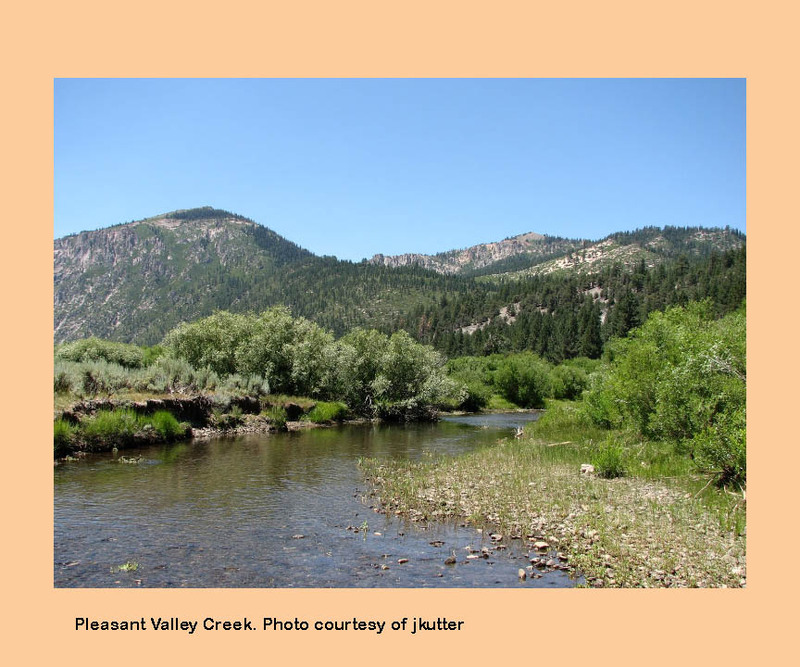 Pleasant Valley Creek: This the only exclusive flyfishing area in Alpine County requiring barbless hooks and a two fish limit. It is a fee-use only area since it lies upon private land. Local guide Jim Crouse handles the permits for this area and can be obtained through him at Alpine Fly Fishing (530) 542-0759. The fishing preserve is 3.5 miles west of Markleeville off Hot Springs Road. It is a spring-fed creek known for Rainbows that reach up to 5 lbs. The pocket water below the campground contains the largest fish but is tough fishing due to the shrubs and trees lining the stream. Woolly Buggers and Ant patterns are good through the day. White Wulffs #14-16 are producers during the evening hours. 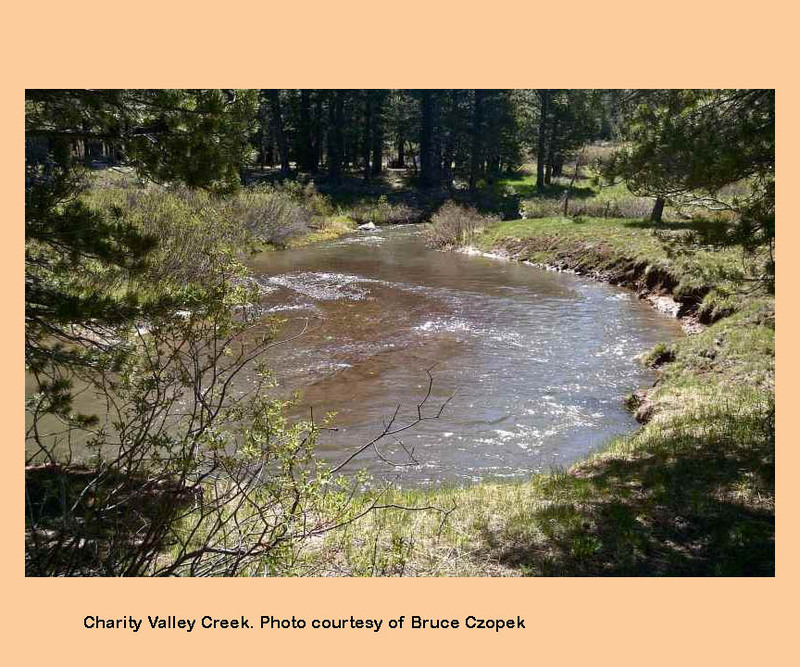 Charity Valley Creek: 6 miles south along Blue Lakes Road from Hwy 88. Trailhead to Burnside Lake. Contains Brookies. 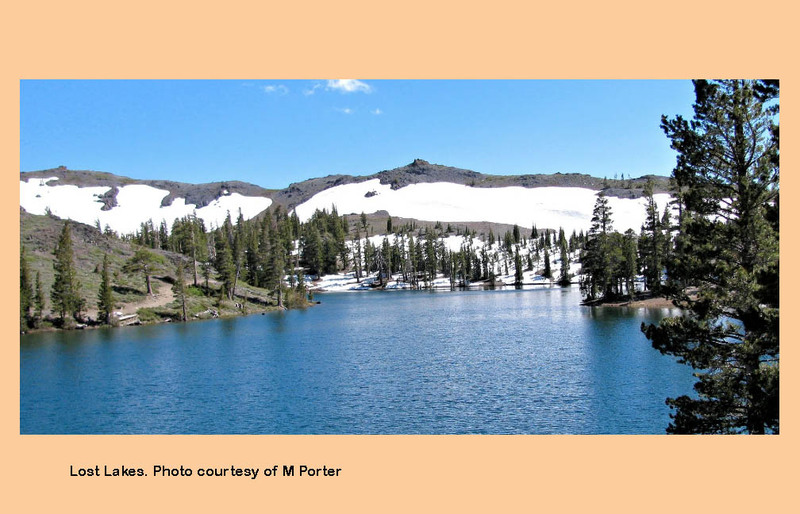 Twin Lake: From the trailhead at Lower Blue Lake, Twin Lake (elev: 8170 feet) is a 2 mile hike. 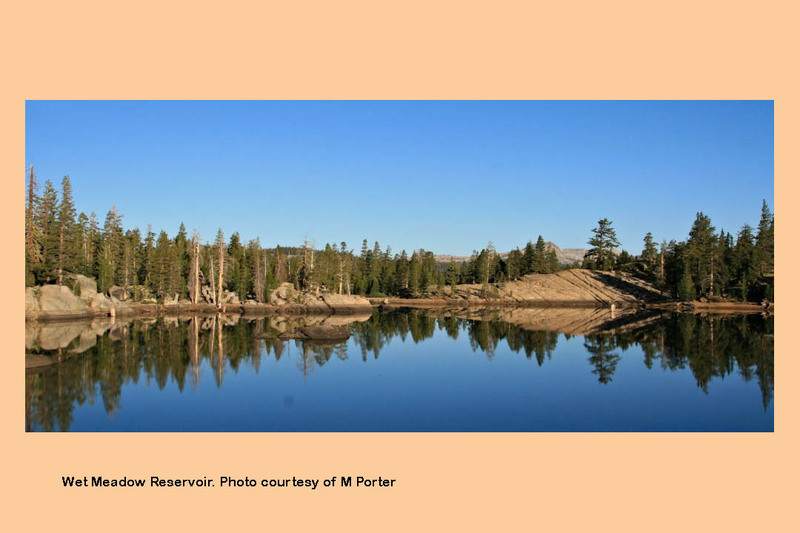 It contains Lahontan Cutthroats and Brookies. 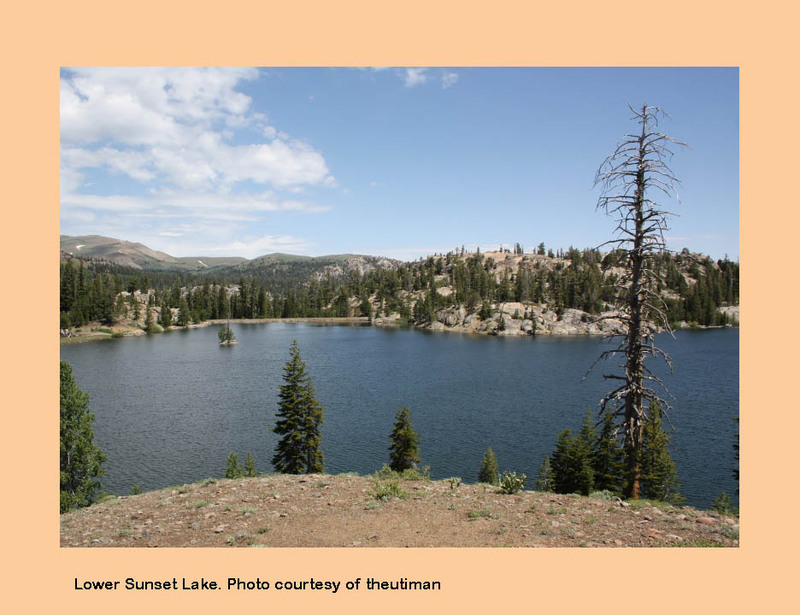 Evergreen Lake: From the trailhead at Lower Blue Lake, Evergreen Lake (elev: 8450 feet) is a 3 mile hike. Stocked in 2013 with Lahontan Cutthroats. 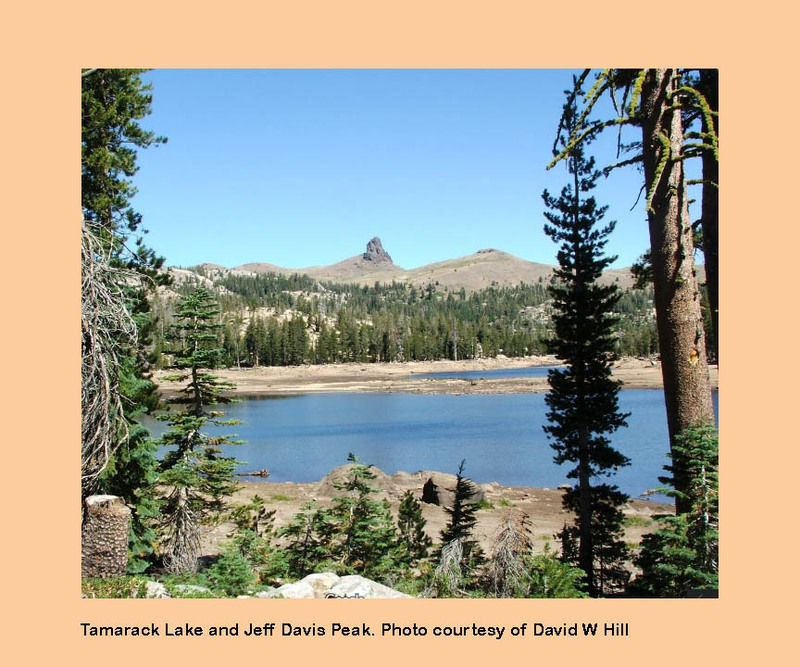 Tamarack Lake: Tamarack Lake (elev: 7871 feet) about one mile off Blue Lakes Road. Contains Lahontan Cutthroats. Sunset Lakes : Sunset Lakes (elev: 7863 feet) about two mile from Tamarack Lake, a dirt road available requiring high clearance. 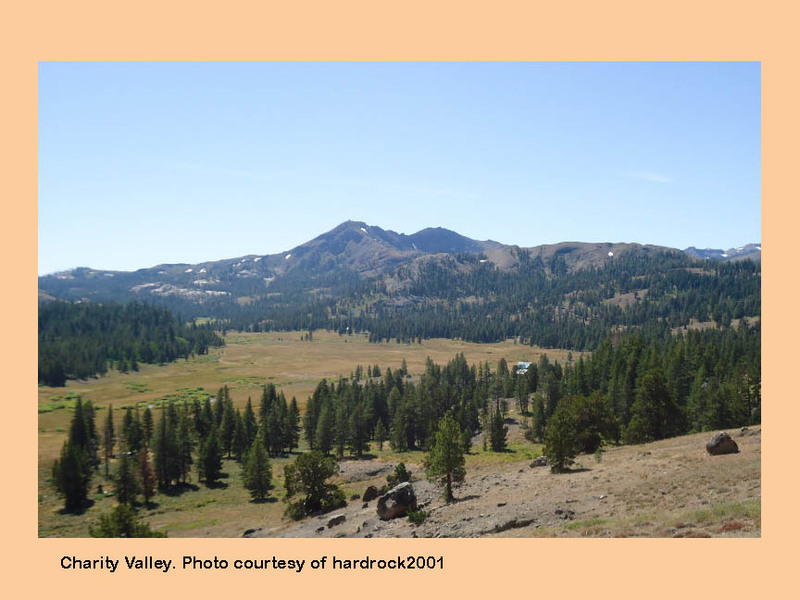 Contains Lahontan Cutthroats and Brookies. Wet Meadows Reservoir : This reservoir is drained annually and not stocked with fish. 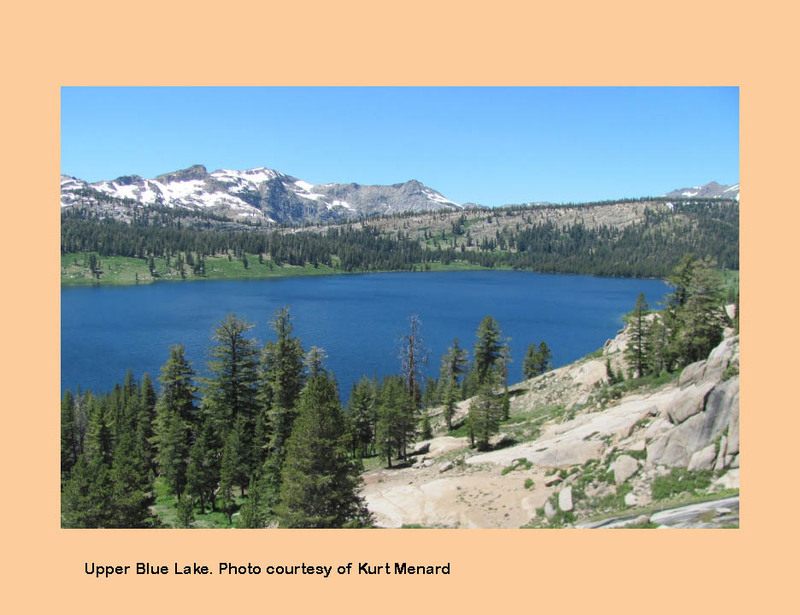 Raymond Lake: Raymond (ele: 9,100 feet) is about 4 miles beyond Upper Kinney Lake on the Pacific Crest Trail. The lake contains Goldens and Lahontan Cutthroats. Ice-out is usually around mid-July and is best time to fish these waters since the larger Goldens will move into the shallows to feed. 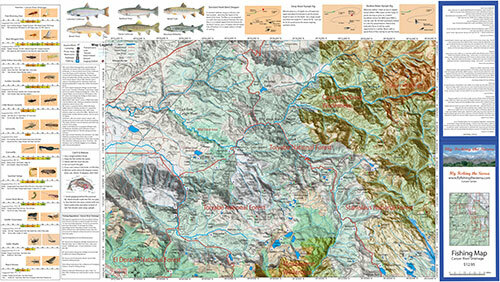 Covers the watershed areas of the Carson River within the Sierra, including Blue Lakes. Shows topographic relief, GPS Long./Lat., camping areas, road access, and Trailheads. Special Features are Suggested Flies, Nymphing Rigs, Fishing Season and Regulations, Fish Identification, Catch & Release Procedures, and Stream Etiquette guidelines. Printed on Rite-in-the-Rain Paper that will allow you to write those special notes. Waterproof and Durable.